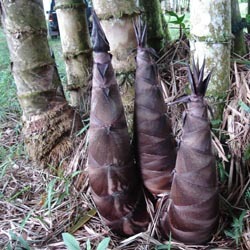 Edible bamboo shoots come out in the spring, near mature groves. Edible varieties are at least an inch or so in diameter at the base. Some bamboo species produce shoots that are thin and thus produce too little edible pith to be worthwhile. Harvest the thick shoots before they reach about a foot in height. Bamboo shoots are a popular food item in Asia, and are a good source of Vitamin C and many of the B vitamins. The tender pith is whitish or yellowish white and is “crunchy” like a fresh apple, with a pleasant, subtle taste. Cut the bamboo shoots at the base. When preparing them for cooking (or for salads) remove the fibrous, leafy exterior layers. Any layers with a reddish tinge are tough and should be removed. You will be left with a whitish pith that you can now slice diagonally into 1/4″ thick pieces. These can be stir fried, cooked in curried coconut milk, added to a salad or prepared in many other ways. Common edible bamboo genuses include Bambusa and Phyllostachys. They say black bamboo isn’t that palatable, though I haven’t tried it. 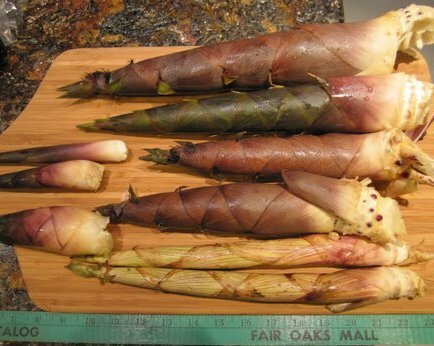 If you don’t have bamboo shoots growing in your area, check with your local Asian food store to see if they have it.